You may remember a while back when we went to Habitat’s Design Reunion launch. It was there we first set eyes on the lovely textile designs of Sarah Campbell with her ‘Fifty Leaves’ rug. Tell us about the first place you called “home” and how did you make it your own? When I was a child I played in the garden a lot and my first ‘home’ was a little wooden shed under the hawthorn tree, which I called Maytree Cottage! I loved making house in there with pint-sized wooden chairs painted bright yellow and a round scarlet table. I remember painting it blue inside with very flakey paint that scattered bits everywhere, pinning up worn linen tea-towels for curtains and laying something textiley on the floor as a rug. The added advantage was that I could climb up, sit on the roof and talk to George, the boy in the next garden. I’ve loved sheds ever since! From winning the Duke of Edinburgh Designer Prize in 1984 to working with big brands such as Habitat, West Elm, Liberty of London and Jaeger, you’ve worked on some really exciting projects, what has been your favourite design achievement to date and what would your dream collaboration be? I’m certainly proud of winning that famous prize – over the 52 years’ of its existence only one other woman ever won it! To be acknowledged by one’s peers is sweet indeed. Susan and I did many special and lovely projects over our fifty years working together, many chronicled in our beautiful book (The Collier Campbell Archive 2012). Bringing good design to the high street has long been a matter of principle and pride. I’ve been fortunate to have been able to continue and expand my career in such varied and interesting ways since my sister died – so, to answer the question – my favourite design achievement will be the next one! As for a dream collaboration – I was very taken with the huge Valspar Paint inside-out house mural recently and would love to be similarly expansive with pattern – and I think I’d really enjoy teaming up with Vans as I wear their shoes pretty well constantly. 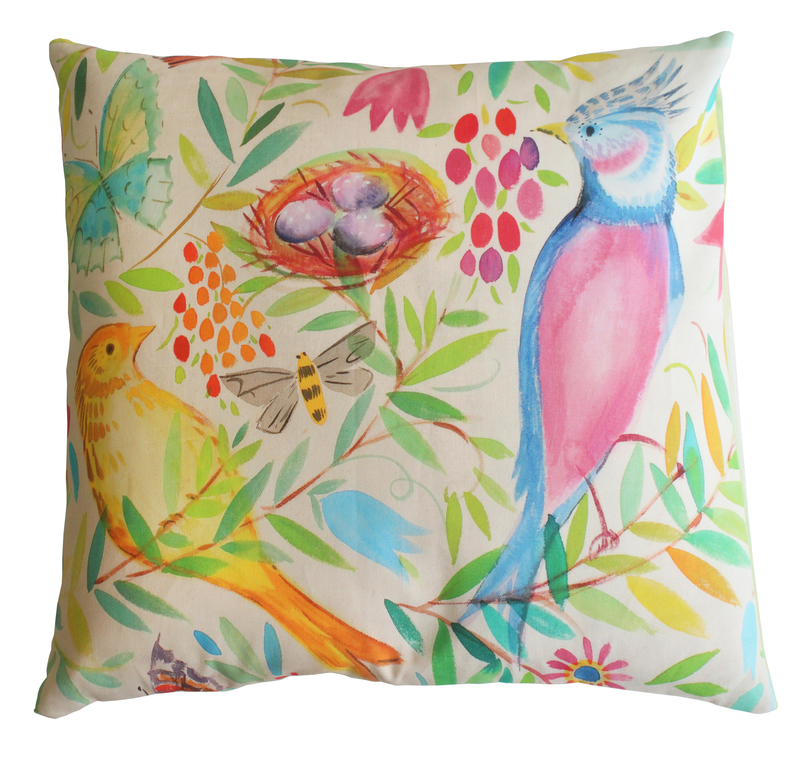 The Calico Birds cushion collection came directly from a commission I’d received to paint a set of window blinds. 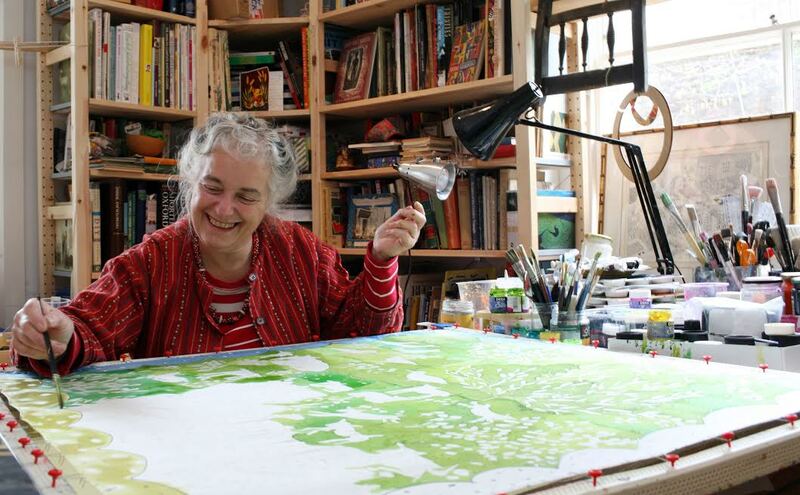 I was asked for birds and leaves – the window looks out onto a verdant garden – and I painted them, three panels about 3m high, straight onto calico. I loved the way they turned out, and it seemed the perfect opportunity to start to develop our own little home range using some of that imagery on cushions. Thanks to digital printing they retain the spontaneous feel of the original painting. With such lively nuances of colour and line they offer a merry alternative to current ubiquitous scandi flatness. It was hard to pick which birds to use from the many that had flown in; in the end we’ve made four different square cushions and two smaller rectangles, all with different painted stripe envelope backs. They’re printed on 100% half-panama cotton. I’m not sure which is my favourite – maybe the Hoopoe – have a look and see what you think. 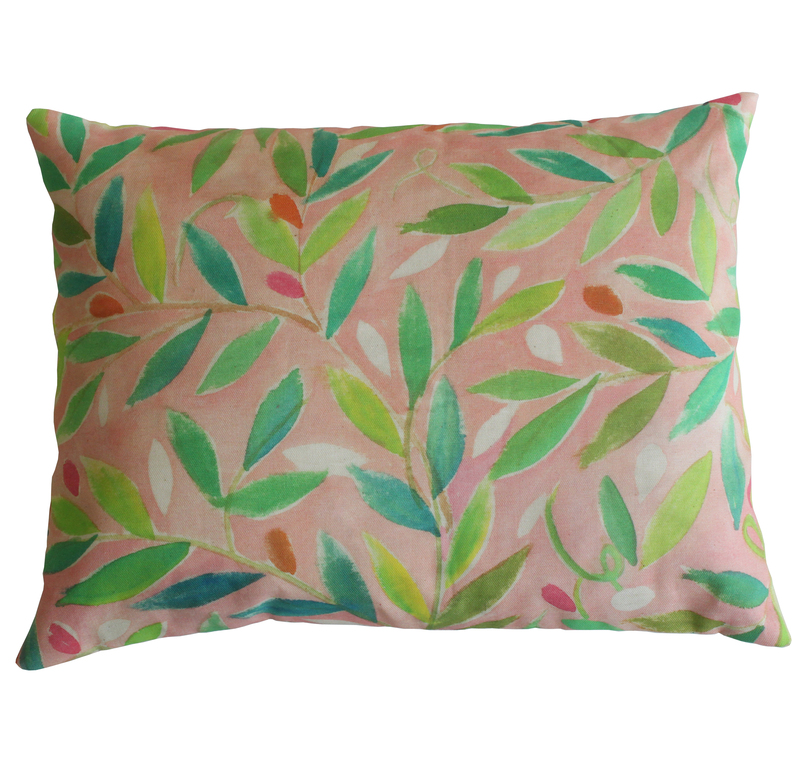 What else is in-store for Sarah Campbell Designs going forward? Do you have any exciting collaborations or projects you can tell us about? SCD has quite a full diary it seems; I work with WestElm (USA) on a regular basis every month and am soon off to their new Brooklyn studio to have a bit of a paint-up there for a few days. And soon after that I’m invited to teach a short course at the Mexican Art School HTF in Guadalajara. Alongside these and other regular design commitments, I write and illustrate my blog, am contributing to the ArtRoom/Selfridges ‘Re-Work It’ exhibition and auction from 30th April, and the Marsden Woo Gallery’s ‘Many a Slip’ show in the summer. And then there’s the product to be designed, made and sold on the Sarah Campbell Designs website – cards, creatures, cushions and very very beautiful new scarves; also available in the Do South Shop, where an ongoing collaboration will see colour and design innovations instore too. Not much time for a lie-in! Finally, we always love to hear some advice. 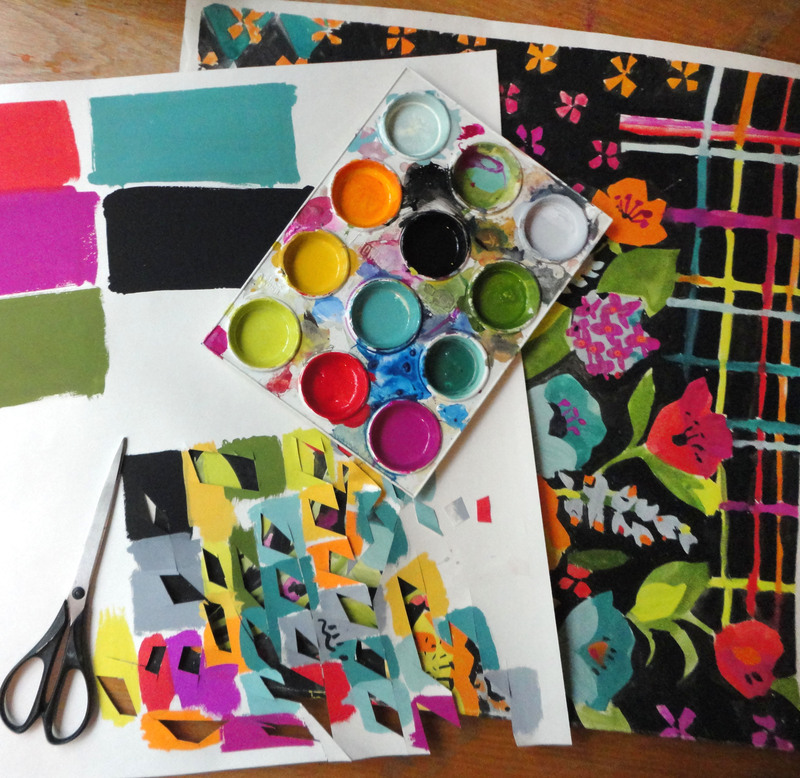 Is there any words of wisdom you’d pass on to those wanting to go in to the world of textile design, or perhaps something you’d say to your younger self? My advice to any designer receiving a brief is – listen well to your customer. Then I’d say – your first response is the strongest – it may not be right in the end, but it will tell you a lot. Then I’d say – trust your instincts. Then I’d say – do first the things you find easiest – it will give you the confidence to tackle the harder things later. Advice which we think would ring true and could be applied whether you’re in the arts and creative industries, or not. It sounds as though Sarah has quite the packed schedule for the months ahead! Very exciting all the same and we can’t wait to see what SCD has in the pipeline. Thank you to Sarah for taking the time to answer our questions and for giving us an insight in to her world – discover more about Sarah here!